Home to half of Fiji’s urban population and the largest city in the South Pacific, Suva is the heart and capital of Fiji. 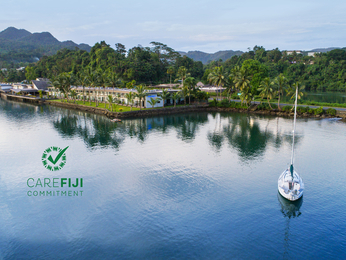 Boasting a vibrant Indo-Fijian community, modern shopping malls, bustling farmers markets, exciting nightlife, and a huge range of leisure, adventure and cultural activities, Suva is a must-see for anyone holidaying in Fiji. Located on a peninsula, this busy little city offers a wondrous mix of modern buildings and traditional colonial architecture. Visit Orchid Island, the Sacred Heart Cathedral, the Government Buildings of Parliament, or escape the beach and take a day tour trek across dramatic peaks, pristine forests and sparkling rivers. If you’re looking for Suva accommodation, you’ll find waterfront tranquillity and gorgeous garden and island views at Novotel Suva Lami Bay. Our friendly local staff can recommend a wide range of things to do, whether you’re interested in sampling authentic Fijian cuisine or indulging at one of the many day spas.